Judge Ibrahim Osman said the words that Rayer had used in reference to UMNO did not amount to sedition as alleged. 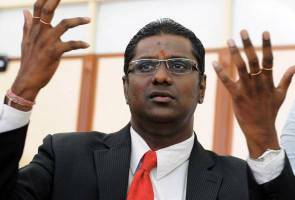 GEORGE TOWN: The Sessions Court today acquitted and discharged Seri Delima state assemblyman R.S.N. Rayer for having used alleged seditious words in the Penang State Legislative Assembly two years ago. "The court found that the speech of the accused did not refer to any community or group of people but only to specific individuals, namely Datuk Seri Reezal Merican Naina Merican and Datuk Shabudin Yahaya. "UMNO is a political party registered under the Societies Act, just like other organisations such as DAP, PAS, PKR and others. A statement against a political party cannot be regarded as words used against a certain community or group of people. "The court is of the view that a statement against a community must be clear or explicit rather than implicit. If the court were to regard a political party as being specific for a certain community only, it would give a negative impact and can lead to unhealthy implications," he said. Rayer, of the DAP, had pleaded not guilty on Aug 27, 2014, to having uttered the alleged seditious words during a debate in the state assembly on May 20, 2014. In court today, he was represented by a team of lawyers led by Gobind Singh Deo. DPP Lim Saw Sim and Farah Aimy Zainul Anwar appeared for the prosecution.